Sometimes books just fall through the gaps in our review schedule, to nestle unread beneath the mire and dust deep in the gutter of our blog's overspill bin. 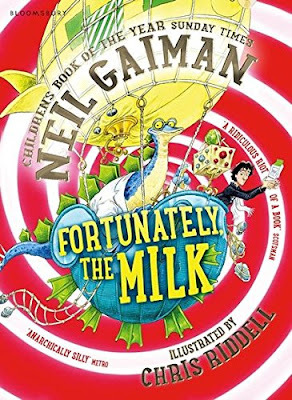 Well, that's not actually what happened with "Fortunately, The Milk" by genius author Neil Gaiman and equally genius illustrator Chris Riddell (or fantastic artist Skottie Young if you're a US reader!). You see there we were, back in 2013, all geared up to review the very socks off this fantastic book. We waited and waited, we wrote about it lots, full of anticip..........ation and joy. But the review copy never turned up. Now, I'm not going to have a go at Bloomsbury here as they do send us lovely things to review (though only 'propah' journalists get their middle grade / Harry Potter stuff). This one really fell through the cracks, and after recently hearing many Twitter folk describing it as a brilliant example of a time travel story for middle graders, I thought I'd just better go and flippin' well buy a copy 6 years late. So, was it worth the wait? Here's a thing. Sometimes when you've wanted to read something for ages, you can get so over-hyped about a book that when it finally arrives it can't possibly measure up to the hype. Thus was the case with "Fortunately, the Milk" which started out OK, but took a good few re-readings before I finally "got" it. It's the story of an ordinary family. A mum, a dad, a couple of kids. As is the norm with children's books the mum is a hyper-powered corporate suit-wearing superhero who is nipping off to a conference, leaving the slightly hopeless but well-meaning dad behind to look after the kids. Unfortunately, the milk. Yes, as you'd probably have guessed, Dad forgets to buy any but the next morning, before breakfast, he nips out to the corner shop to obtain the revered cow-juice. But it takes him a VERY long time to get back. This book chronicles the story of why, and it's an adventure that splits realities, spans time and space, features a rather brainy dinosaur by the name of Professor Steg, some nefarious pirates, crazy tribespeople who worship The Great Splod, and some wumpires who definitely don't want any milk. Not at all. Sum this book up in a sentence: A completely bonkers, hatstand, surreal journey across time and space to ensure a pair of cheeky kids get something to splosh on their cereal by a dad who may be ordinary but manages to pull off something quite heroic without stuffing things up too badly. "Fortunately, The Milk" by Neil Gaiman and Chris Riddell / Skottie Young is out now, published by Bloomsbury (self-purchased, not provided for review).